Ibinabo Fiberesima is a popular Nigerian entertainer, she is popularly known to be an actress and the president of the Actors Guild of Nigeria, she is an ex beauty queen and presently a pageant organizer, she is the organizer of one of the most popular beauty pageants in Nigeria “Miss Earth” and more outside Nigeria. Ibinabo Fiberesima is a Nigerian actress, ex-beauty queen and Events Manager. She is from Rivers State, Nigeria, and she is the child of Dr J.B Fiberesima and an Irish woman. Ibinabo attended the Y.M.C.A Play Centre, Port Hacourt and had her secondary education at the Federal Government Girls College [ F.G.G.C ], New Bussa, Niger State, Nigeria. She graduated from the University of Ibadan with B.A Degree in English Language and Literature. When she was younger she did the Most beautiful girl in Nigeria, she was second runner up, she then did Miss Nigeria and she was first runner up and finally she did Miss Wonderland and emerged the queen. She got into entertainment after winning the Miss Wonderland Beauty Pageant in 1997. She was the First Runner up at the Miss Nigeria 1991 beauty contest. Due to her love for music and the arts, Ibinabo went into Night Club Management in the 90’s and she ran her club, Pyramid and Karaoke, [ A gift from a lover who was besotted with her ] for six years. As the years rolled on, Ibinabo also started acting. I hope you’ve not forgotten her solid performance in ‘Most Wanted’ ( Nigeria’s version of ‘Set It Off’. An American movie featuring Queen Latifah in a Gangster role ). Besides acting in other movies, She has also produced a movie ‘A Night In The Phillipines’. Till date she has featured in several Nollywood movies. She also contributed positively to the Nigerian Music Industry by appearing in Music videos especially those of Edward Inyang, whose stage name is Blackky. Ibinabo is the National Director for Nigeria to the Miss Earth Beauty Pageant and Miss International Beauty Pageant [ RV is not sure if the named Paegants are still being organised these days ]. Ibinabo was known to be in a romantic relationship with fellow actor Fred Amata and even have his children. The recently re-elected president of the Actors Guild of Nigeria (AGN) is mother to four children and wed for the first time her old friend Uche Egbuka. Ibinabo has been in the spotlight in recent years after accidentally killing Dr Suraj Giwa in a car crash in 2005. She has been to court several times and has been handed a jail sentence. However, she avoided spending much time in jail after she was sentenced in 2009. It is not clear when her court battles with the Giwa family will end. After your horrible prison experience, how is life treating you? Life has been nice to me. I’m a more relaxed person now than before and I’m at peace with myself and you can notice it. What would you say is the lesson that your recent experience taught you? Life has taught me to be more careful; to look before I leap. In the past, I used to take a lot of things for granted, but now, I’m calmer. I also pray a lot these days. Do you see yourself as a testimony of God’s mercy? Yes, I’m a defined testimony of God’s mercy. The accident, the trial and the trauma I had to pass through, and finally my release from prison is worthy of a testimony. I actually don’t remember the accident anymore and it’s amazing. I never believed I could get over the trauma. While it lasted, I locked myself up in the darkness of my little world for several days without food. It was close to hell. But I must tell you; the depression, the trauma and the pain were unbearable. I came out of Kirikiri prison, feeling dejected, and abandoned. People no longer wanted me around them any more . But like I said earlier, it’s a different world today. Surprisingly and in spite of my incarceration, I’m still celebrated and recognised as a celebrity in the country. What went through your mind the moment you were ushered into the prison? First, when I was ushered into the Black Maria, after the court verdict, I went into a shock. I cried out for help, but nobody heard my cry . And when the Black Maria moved from the court to pick other inmates in other courts, it dawn on me that the game was up. When we got to a particular court, I refused to climb down from the Black Maria. There, a woman joined me with a child. I was dumfounded. As I summoned up courage to ask what she was doing with a child in a Black Maria, she said to me; “I don’t have anywhere to keep her, hence I’m going to prison with her.” I felt bad. Eventually, that same baby was soon to become everybody’s baby in prison . More drama was soon to unfold as the Black Maria approached the prison gate. I passed out. I couldn’t believe it. That I, Ibinabo was going to make the prison my new home. For three days, I was in a shock. And when I recovered, I started receiving inmates who called to sympathise with me. Soon, life returned to normal and my interaction with other inmates became cordial. Life in the prison could be compared to life in a female hostel in high school. And since I was a boarder in high school, I was quick to adjusted to the environment. But what hurts most was knowing that some inmates had spent between five and seven years on awaiting trial. All of these will be contained in my prison notes which will be published soon. How did I meet Christ, you may want to ask me? In prison, there was a particular pastor that got me to reflect on what brought me to Kirikiri. I thought of so many things including how I begged the family of the man I knocked down. I also thought of my relationship with God and wondered if l was on a good stand with Him. I wondered if that may have been responsible for my woes. As I pondered over these things, I got connected to my creator. At that moment, he told me “this is the path you are going to follow from today if you must find peace in life”. While the trial lasted, you were always covering your face. Was it done as a result of shame? Yes. It wasn’t a picture I would want to see when I’m out of the prison. If I had allowed my frustration to be captured through the lens of the press guys, it would remain in my memory forever. How did the warders treat you? The warders were nice to me. I was amazed at the way the warders treated me . Is it true you were drunk when the accident happened? I was not drunk. I was going to pick up a friend’s daughter at school on Victoria Island. She’d gone to the saloon to make her hair. I was on my way home when she pleaded with me to stop over and pick up her daughter and another lady. As the lady was not properly dressed, I was counseling her when a group of four guys in a red-car, smoking at random, for no reason trailed and tried to overtake our vehicle. Sensing danger, I increased my speed, but the guys double theirs. While trying to avoid hitting their car, I swerved to the other lane and unfortunately collided with two cars on motion. That’s exactly what happened. When the accident happened, I passed out. And when I woke up, I found myself in the hospital. As I speak with you, I am yet to set my eyes on that car. I don’t know where they kept the car. And each time I read stories concerning the accident I always feel very bad. During the trial, did you at any point feel abandoned by relations and close friends? Abandoned by my friends yes, but by family members, no. They stood by me, while the trial lasted. A year before the accident in 2005, I had relocated to Port Harcourt. I was in Lagos for a meeting with management of the African Independent Televison (AIT) regarding my annual Miss Earth beauty pageant. They were to partner with my organisation for that year’s edition. Since the incident happened, I have learnt how not to trust anybody anymore. I put my trust now in the Lord. And this is better explained in the new song I recorded. The music captures my story. Emotionally, I have been drained and to some extent humiliated, even in public. I recall a particular situation, where I was called a murderer at a friend’s wedding by a certain lady. I had stopped to greet a friend when she asked my friend “is that not the murderer”. I was furious as I confronted her, demanding that she differentiate between manslaughter by accident and murder. But she later apologised to me, blaming her action on what she read in the national dailies about the accident. I wasn’t happy that I was involved in that accident and I have said it over and over again that I’m deeply sorry that it ever happened. I don’t know how else to atone for the accident. (The tears started rolling down her cheeks). I started begging my victim’s family from the very day, the accident happened. My family attended the funeral rites, service of songs and I even attended the 40 days prayer when I was strong enough to move about. I met with the mother and the wife of the deceased. There’s virtually nothing I didn’t do to plead with the deceased’s family to let me off the hook. I’m still pleading with them as I speak with you right now. Read ALSO: Actress Yvonne Okoro Full Biography,Life, And News. No, I have not been married. My first son’s father died. We lost him and my second child’s father could not stay with me. Something happened along the line and we couldn’t be together. When the media came after me, my guy thought I was the one giving out our personal information to them. I tried to explain things but he wouldn’t listen. So we went our separate ways. Thereafter, I met my heartthrob, Fred Amata and again the press got involved. Fred was my friend first of all, before he became the father of my baby. The press started writing that the mother never liked me, even as I speak with you, Fred’s mother and I are the best of friends. I talk with her almost every day. I was accused of breaking Fred’s marriage. I met Fred, four years after he was separated from his wife. So how could I have caused his marriage to crash. If Fred decides to make peace with his wife, I wish them well. I have a relationship with Fred, he’s my baby’s father. I respect and love him. That does not take away the fact that I’m still single and searching. I want to marry and have a complete family. I know God will grant me my heart’s desire because I live a Christ- like life now. That’s all that is missing me, I want to be addressed as Mrs Ibinabo, I really want to settle down. On 11th of March 2016 the appeal court sentenced her back to prison to complete her 5years sentence. 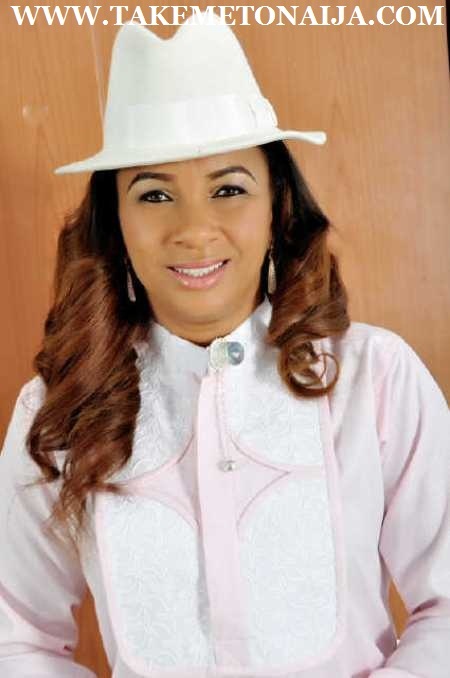 Embattled President of the Actors Guild of Nigeria, Ibinabo Fiberesima is in the eye of the storm as she faces spending time in jail if the decision of a Lagos High Court imprisoning her is not quashed. This is coming on the heels of her 10-year-old manslaughter case which is awaiting the judgment of the Appeal Court sitting in Lagos. The case involves the death of a Lagos doctor, Giwa Suraj which happened in February 2006 after Ibinabo hit him on the Lekki–Epe expressway. The trial, which has been heard at various lower courts, has seen the actress, who was once fined N100,000 by a Magistrate Court, sentenced to a 5-year jail term by a High Court for dangerous and reckless driving. The case came up again yesterday, January 28 at an Appeal Court sitting in Lagos as the actress filed a suit challenging the ruling of the Lagos High Court who handed her the 5-year sentence. Ibinabo, who was absent at the trial, is asking that the decision of a Lagos High Court which sentenced her to 5 years imprisonment be quashed. The appellate court presided over by Justice Ndukwe Anyanwu has however reserved judgment to a later date with the judge ordering that the actress be present on the day which would be communicated soon. Won the African Woman Of Worth Award in 2014.